The gooseneck design, steel construction and dual deadbolt locking system make the Secure Mail Vault far more secure than the average locking box. The interior door sets back 2 inches and is secured by heavy duty deadbolts to ensure safe storage of your mail. A 1 - 8 digit security code can be easily programmed for quick keyless access to the mail inside. Holds 2 unique PIN codes. The oversized drop shoot and generously sized storage area can accommodate over a week’s worth of mail and even small packages. Programming takes only a few minutes and once PIN code is set, access to the Secure Mail Vault is as simple as punching in your code and opening the door to retrieve the mail located inside. Installation can be accomplished by any handy homeowner in approximately 20 minutes. An easy-to-follow user guide is provided for quick and easy installation. 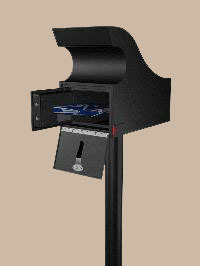 Even the most experienced thieves will be stumped at how to penetrate this curbside mail guardian. It’s recessed inner door make it pry-bar safe, the dual deadbolts lock securely into the heavy steel body, and there are no key holes to try and drill out. The powder coated steel body and pole is made to withstand even the harshest elements and extreme weather fluctuations. Operates on 4 AA batteries so there is no electrical wiring to fuss with or electrician to hire. In addition, each Secure Mail Vault includes an external battery box to use if your batteries should die. Place your outgoing mail underneath the outside door’s mail clip and pull out the mail flag to alert the mail carrier of a pick-up. In case of a dead battery, a hidden back up lock is included for immediate access to your Secure Mail Vault. The Secure Mail Vault comes with a heavy duty steel mounting pole and flange. Everything you need to get your new curbside vault up is included, a few tools and a bag of cement you’ll be quickly on your way to total mail security. 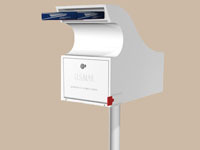 Most mailboxes are not certified by the U.S.P.S to be placed on your curb for mail delivery. The Secure Mail Vault is not only certified and approved but it is also designed after the Postal Service drop box. The Secure Mail Vault is available in a crisp black or a stark white. It will blend seamlessly into any home style, color, or design. The Secure Mail Vault’s robust strength and vandal proof design make it a perfect solution for anyone looking to keep their mail out of the hands of thieves until they can pick it up. Its husky size is big enough to hold a substantial amount of mail and strong enough to withstand vandalism, tampering, weather and even your occasional baseball bat. No other brand on the market offers the same level of technological components, versatility, and quality that Secure Logic products possess. The Secure Mail Vault will provide many years of mail security.